The school opened with 2 teachers and 60 students the first year. Miss Bernice Kiker taught 1st & 2nd grades and music and Miss Margaret Burleson taught 3rd & 4th grades and art. Miss Kiker would stay at Travis Heights for 31 years moving her way up to principal in 1947 and remaining in that position until she retired in 1970. The school colors were maroon and blue. The student population grew rapidly to more than 200 students by 1945, who were served by 6 teachers. By 1946 the Halloween Carnival tradition was in place. The carnival that year included food service at 6pm (hot dogs, soda water, sandwiches, coffee, pie, & cake). Game booths opened at 7:30 and included: Bingo, Cake walk, Fish pond, Grab bag and a Hat show. In 1950 the growing student population required an expansion of the building. Prior to this addition, some students had been attending school in half day shifts due to the overcrowding. The new wing included 4 classrooms for 1st grade, a combination cafeteria/auditorium, a playroom, a state of the art kitchen, office space, a workroom and storage rooms. The addition allowed students to attend on a full day schedule. The new wing was called “our pink school” by students due to its bright colors. An article on the school’s open house indicated that “Early visitors have reported that no other school has followed such a noticeable scheme of bright colors.” The kitchen was described as “one of the most modern kitchens in the Southwest.” It also noted that the new classrooms were designed to be spacious, not so that more students could be crowded in, but to allow “pupils room for work activities, and pleasant surroundings.” The school also expanded to include 4th grade. In previous years it only housed 1-3rd grades. In the late 1940s and early 1950’s the PTA worked to host the carnival, and other fun nights during the year. The carnival was the primary fundraiser for the school. Profits ranged from $200-600 dollars and were used to purchase items for the school. During this time the PTA also worked to develop home study groups with topics including: Hobbies and How to Develop Them, Home Beautification (upholstery, flower arrangement, and slip covering), Parent and Child Relationship in the Home, The Family Budget, Home Safety (prevention of accidents and illness), Sewing, and Quick and Easy Meal Preparation. In 1951 a Pre-School Study group was created and guest lecturers were brought in to inform parents on various topics relating to early childhood. Parents also arranged transportation to the Austin Symphony Children’s Concerts and a Mother’s Singing Group was organized. The PTA also helped to organize the paving of Alameda Drive and worked for several years to gain support from all the neighboring homeowners to allow the paving project to move forward. Additionally, the PTA presented a plan to the city to allow for expansion south of the school. This included vacating parts of Algarita and Sunset Lane near Stacy pool. In 1953, the school colors changed to the current red and white. Travis Heights was also noted for having the first female head custodian in the district. At the time, parts of the job like changing light bulbs and lighting the furnace were deemed unsuitable for a woman. However Ms. Johnson proved up to the task and was much appreciated by the school. 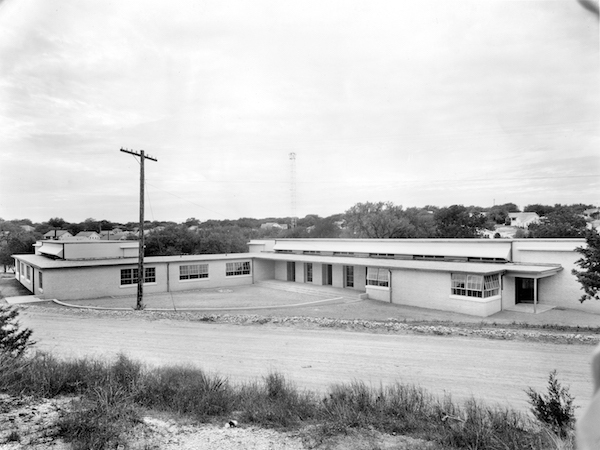 In 1955, 5th and 6th grades were added to the school for the first time bringing the student population to 480. The building was expanded to include 7 new classrooms. This is the current Kinder/ Pre-K wing. In 1956, the creation of a “Dream & Scream room” at carnival where students could pay to listen to Elvis records was featured in several newspaper articles. It was noted that the room was located well away from other events to spare the mothers’ ears. In 1970 Bernice Kiker retired and Ralph Finklea became principal. In 1973 Travis Heights became a 6th grade center. AISD was trying to comply with a judicial order to desegregate its colored schools. They started with High Schools and worked their way down. Creation of the integrated 6th grade centers was the final step in achieving desegregation according to the court system. The PTA unsuccessfully fought Travis Heights’ designation as one of the 6th grade centers because it meant that the neighborhood students in lower grades were bused to other schools. Students moved to Becker, Linder & St. Elmo schools. In 1980, Travis Heights once again became an elementary school and Valerie Walker was named principal. The PTA sponsored carnivals, taco suppers, game nights, spring flings and a Christmas program so popular it was held at Travis High school to allow room for the audience. In 1983, Travis Heights teachers attended special computer literacy training and plans were underway to incorporate computer literacy into the curriculum and have 10 computers for students to use at the school. In 1985 the building was renovated to include larger office space, a new library, renovated classroom space, and a new gym. Student populations in the late 1980’s ranged from 600-700 students. Janet Kennedy became principal in 1986, followed by Marilyn Butcher in 1989. In 1989 the school celebrated its 50th Anniversary. On the 50th day of school students dressed from a past decade, there was a school assembly and birthday party and each class made a 50 themed cake. In March a reunion tea was held. This event honored Ms. Kiker for her many years of service and profiled the school’s history with memorabilia and displays. Students created a stained glass mosaic which hangs in the school today. Fifteen students from Art enrichment program painted a mural “The Legend of the Thunderbird” on the end of one of the portables. This also is still visible today. In the early 1990’s the school housed many portables which were deemed to be a fire hazard due to limited paved access for emergency vehicles. 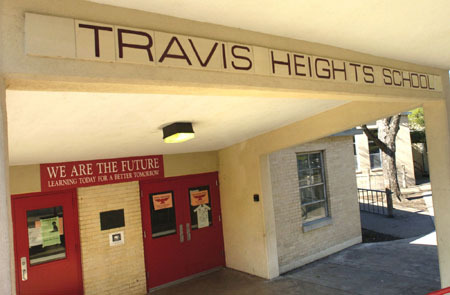 The parents and PTA petitioned the school board to add another building at Travis Heights. In 1994, the new wing opened. This included 11 classrooms, and an art room. It replaced a 2 room building which was in that spot. It also eliminated the need for the many portable buildings which were on city park land and allowed the construction of a shared city/school parking lot. The early 90s were also a time of innovation at Travis Heights. The school began using multi-age classes and a “no failure plan” for assessing student progress where narratives were used instead of number or letter grades. The school received recognition for its innovative methods. In 1993 Travis Heights became a mentor school for the Texas Education Agency’s Texas Elementary and Early Childhood Network. In 1995 they were named one of the nation’s 10 “Great American Schools” by the National Education Association. Additionally they were the recipient of a grant from the Texas Children’s Mental Health Plan that allowed them to have a full time nurse, social worker and family preservation therapist on campus. The campus was also noted for its parental involvement and shared-decision making. In 1996 the Annual Young Writer’s Workshop was born. After Marilyn Butcher retired in 1996, the school had a series of principals until Lisa Roberston came in 2004. In 2006 the model of the Young Writer’s Workshop was used to create the annual Young Scientist Day. The following year, renovations to the library expanded its space and added the storytelling Kiva. In 2010 Travis Heights began its two way Dual Language program. In December 2012 Travis Heights Elementary was proud to become AISD’s first in-district charter school. This designation allowed the school more freedom to select its curriculum and programs. From this freedom, THES developed four pillars: Blended Learning, Project Based Learning, Dual Language, and Whole Child Instruction. Blended Learning is an instructional model which integrates technology into the learning process. Students split their time between self-paced computer programs and small group instruction. This allows for teachers to individualize instruction to each student’s needs. Teachers also began using Project Based Learning (PBL) and Service Learning methods which help students learn in a hands-on manner and to apply the skills learned in the classroom to the wider world. As a part of the Whole Child pillar, Travis Heights adopted the district’s Social Emotional Learning (SEL) Curriculum in which students learn critical life skills such as recognizing and managing emotions, communicating appropriately, solving problems effectively and establishing positive relationships. The school also works to encourage active movement throughout the day and outdoor classroom areas allow students to garden and care for chickens. Travis Heights Elementary is looking forward to continuing to refine these initiatives as we move toward the future.